When a Tree Becomes a Hazard | Mr. Tree, Inc.
Should I Remove My Tree Stump? Can you imagine owning a home and not having trees in your yard? Here in the Pacific Northwest, that’s hard to conceive. Nothing gives your home more curb appeal than having a nicely landscaped yard with beautiful trees strategically placed throughout your property. They add shade, protect your house from the elements, and can even provide a nourishing snack late in the season. Trees add value in many ways. They can uplift our spirits and provide aesthetic beauty. They can generate a sense of community pride. They can add historical value, especially as trees age and survive turbulent times. They also have environmental value, helping everything from reducing air and noise pollution to modifying the local climate. But like all things, you have to take the good with the bad. Trees can be beautiful additions to your property. But when they become a hazard, they can do an incredible amount of damage. Learning to recognize these hazards early can, in some cases, help you save the tree or, at a minimum, prevent further damage to your property. That’s why it’s important to hire a tree pruning service that will handle the hazard in the correct way. Tree cutters have the ability to safeguard against additional damage done to you and your property. What is a hazard tree? A hazardous tree has a structural defect that puts it at risk for causing potential damage to someone or something else of value. A tree must be within falling distance of people, vehicles, or structures. If it’s off the path, in the woods, or in an open field away from potential “targets”, then it’s not necessarily considered a hazard. 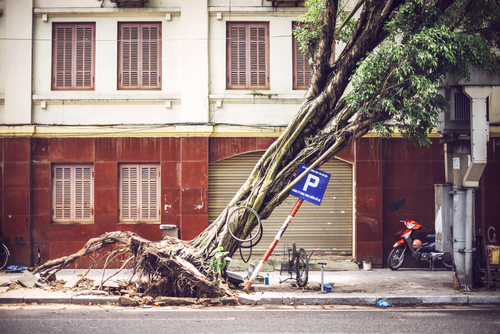 In most cases, trees on urban properties have the chance of becoming a tree hazard. Because it’s always in potential contact with a person, vehicle or structure, care should be taken in advance to prevent any harm that could come to pass. To look for hazardous conditions, do what professional tree cutters do and take a systematic approach. Start at the top of your trees. The top or crown of the tree is often the first place you’ll start noticing problems. It’s different in individual species. Some species are more brittle and show damage in different ways. This is why your local community has guidelines on the best trees to plant in an urban area. Willows, for example, may be beautiful in some locations. But they can be messy additions to the landscape and may be frowned upon in some areas. Are there dead branches? Dead branches are an accident waiting to happen. Many things can cause a branch to die. One may be indicative of a minor problem with the tree, but it can also be an indicator of the tree having bigger problems. If left unchecked, the tree could continue dying in the coming months. Dead limbs are also accidents waiting to happen. They are weaker than the rest of the tree and have the potential to fall with even the slightest breeze. Sometimes it doesn’t take a breeze at all; just a shift in the environment can cause it to let go without warning. And if you, a child, or a vehicle is underneath, severe damage can occur. Branches can break for a variety of reasons. Large limbs can break off when weakened by rubbing together or left unrepaired from storm damage. If a limb breaks at the branch collar, it can be a natural self-pruning process. It also can be a sign of decay. The more extensive the break, the more action is required. If a branch also breaks and compromises trunk tissue, more research should be done to determine why the damage occurred. One branch might be a small problem. But when you see multiple branches that are dying, losing leaves, or dead, time is of the essence. Do you know the history of the tree? Is it looking worse over time? Tree cutters can help evaluate whether a tree has life or not. The trunk of the tree is also indicative of potential problems. Forked tree trunks can be a sign of potential weakness, especially if one of the sides grows up and outward at an angle. Tree cutters often work with these trees early to ensure a higher quality, stronger tree. Early pruning of one side can prevent future problems down the road. Leaning or lopsided trees also present more potential hazards than a tree that is growing vertically. If a tree has always grown off center, it may be at lower risk for potential problems. But if a sudden lean occurs, it could be a sign of internal breakage or weakening of the support system at the roots. You can also look for decay forming around large branches or across the trunk of the tree. Cavities, disfigurations, scars, or fungi can all indicate the tree is weak and suffering from an ailment. Internal decay doesn’t automatically make a tree unsafe. Arborists use many different indicators to determine the health of a tree, to see if it’s okay to leave on a property or if it needs to come down. While it’s fairly easy to keep an eye on the health of a tree through its trunk and branches, it’s a little more difficult to see through to the root system. Root decay is hard to detect. Root problems usually start out small, but can quickly spread. Sometimes small problems work at weakening the smaller feeder roots for months or even years. But once the system is compromised, the tree can die or fall over suddenly; almost without warning. Do you see mushrooms or fungi near the base of the tree? This goes beyond the normal mushrooms you often find popping up from natural environmental conditions. Look for mushrooms near the base, always there, always expanding. Arborists can dig up some of the roots to sample for decay. Also look for severed roots. Construction, renovation, trenching, and property work can all impact the root system in a big way. Severed roots lose their ability to provide the necessary nutrients to the trunk and crown of the tree. And if the roots are severed and left exposed, decay has an easy way into the tree. This means fertilizers and other common household chemicals can easily get into the root system and impact the vitality of the tree. Do you have a hazardous tree in your yard? Let our professional arborists determine if tree pruning would benefit the health or if a tree removal is required.